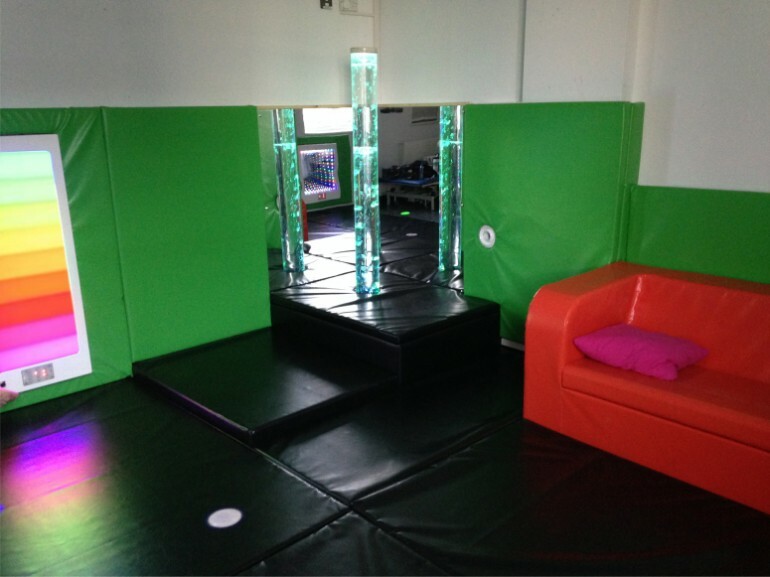 This London Sensory Room installation was carried out a Richard Cloudsley School in Islington. The room was re-designed to include their current equipment and to provide a comfortable safe area for the pupils to relax and enjoy their sensory environment. A new range of sensory products have been included to expand on the interactive elements within the room. We began by installing their existing Bubble Tube in the corner. With a new plinth and acrylic mirrors to the effect of the Bubble Tube. Wall and floor padding has been installed on the same side of this room to provide a safe, comfortable area for the children to rest and enjoy the sensory products. The wall padding is installed to a height of 1500mm and 1100 mm. At their request, we replaced all three of the LCD projectors in the room and connected them to their existing Opti-Music system. This has made use of their system much easier and all controlled from the touch of a button. Our new I-Digital Tower LED Light – This unit is split into different colour changing segments. Can be controlled directly by the children from the built in microphone or via wireless remotes. A UV Light Flood Light that will make fluorescent items glow in the dark. A Wind Machine has been incorporated within the plinth next to the Bubble Tube and is switch interactive for the children. This produces a great reward for the children as it is an interactive tactile ‘Cause and Effect’ product. A Resonance Softplay Pad which is a great addition to the sensory room as it allows the children to feel the vibrations produced by the sound system. All of the products installed are extremely maintenance friendly as the majority of products are all LED’s. This means there are no lamps to change. The wireless remote’s all have a battery life of at least 5 years of heavy use without the need for charging or replacing the batteries – making it extremely maintenance friendly. 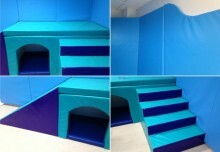 Soft Play Room installation South Wales, Carmarthenshire. 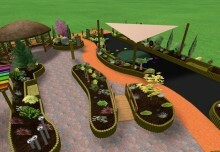 We offer a FREE sensory room consultation, along with 3D Design and Proposal.